The ISI Web of Knowledge database has a new feature: sorting articles by Most Cited. So why not give it a go. 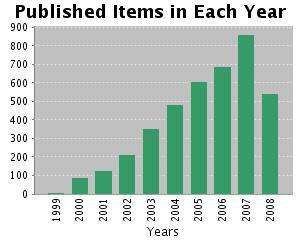 Selecting all articles with topic nanotechnology published between 2000 and 2008 (excluding all reviews, news items etc.) results in 3977 items (H-index 73). Top of the list N.C. Seeman's DNA in a material world on how DNA provides a template on how to construct new materials (2003, 410 citations DOI). Next up Goldberger et al. exploring single-crystal gallium nitride nanotubes (2003, 408 citations DOI). More nanotubes at position 3: Chen et al. report on functionalized nanotubes for biosensor applications (2003, 325 citations DOI).